In the summer of 2016 I began a large-scale experiment investigating the effects of maternal stress on offspring characteristics in the eastern fence lizard, Sceloporus undulatus. My primary mission for the first part of that summer was simple: catch as many lizards as possible in the longleaf pine forests of southern Alabama. When you spend most of your day pursuing a small prey species, you quickly start to think like a predator. In what areas are you most likely to find them? At what times? On what surfaces? The cumulative years of experience of my fieldwork team (colleagues from the Langkilde lab) suggested that fence lizards were mostly found where there was a mix of hardwood deciduous trees and pines, and that they preferred the deciduous trees, like oaks and hickory, to the famous pines of the region. The longer I spent looking for lizards, the more I noticed that this observation held true. I didn’t put much thought into why until one day when I followed a lizard into a small stand of pine trees. I momentarily lost sight of the lizard, until I heard a loud scrabbling from a few metres away – there was the lizard, scuttling up a pine tree on the smooth, dry flakes of its bark. If the noise of the lizard’s claws moving on the pine bark alerted me so easily to its presence, I thought, perhaps the same was true for its real predators! Also – perhaps that noise was indication that this type of bark, with fewer crenulations and ridges on which to grip, was more difficult for the lizard to run on. Together, could these provide a reason that fence lizards seem to avoid pine trees despite their prevalence? We decided to test this in the field. First, we quantified whether our anecdotal hunch that lizards prefer deciduous trees to conifers (pines) was really true by conducting thorough searches for fence lizards throughout our field sites, and noting the tree type we found them on, as well as the availability of trees in that area. This allowed us to test whether lizards were “choosing” deciduous trees in areas where they could also choose pines, as opposed to just being found in areas with only deciduous trees. As we expected, we found that even when availability of coniferous:deciduous trees was more or less 1:1, lizards were overwhelmingly found on deciduous trees, not pines. Next, we tested our hypotheses that tree type changes how noisy lizards are when they move, and how quickly they are able to move. We did this by releasing wild lizards on either coniferous or deciduous trees, and then recording them as we stimulated them to run upwards on the tree by gently tickling their back legs. We then analysed these recordings and found, as we predicted, that the noise of lizards running (the sound level they produced when running compared to the background noise when they were still) was significantly higher when they were running on the smooth, flakier bark of coniferous trees. We also found that the sprint speed they attained on coniferous trees was lower than on deciduous trees. In other words: they are noisy and slow on pine bark compared to the bark of trees like oaks and hickorys. Studies investigating where animals spend their time (either in terms of broader habitat preference, or more localised use of substrates) has often focused on coloration, and the camouflage it may or may not afford. Our study shows that other aspects of camouflage, such as acoustic camouflage, may also be important. It’s also important to consider how substrate affects performance, like sprinting speed: once you’re spotted by a predator, the speed at which you’re able to escape may be just as important as trying to remain hidden in the first place. This was one of my favourite studies to be involved in, for a number of reasons! First, I love that we were able to find ways to test hypotheses based on a very simple natural history observation. Understanding the natural history of an organism is crucial for developing new ideas – and the “why does this happen?” questions are the bedrock of behavioural ecology. Second, this study was an opportunity to bring together friends and start new collaborations! Langkilde lab alum Nicole Freidenfelds brought her great knowledge and understanding of herpetofauna and natural history; local friends in Alabama helped me to identify tree species; I knew of Gavin’s prowess in acoustic analysis through Twitter, and asked him to help with this aspect of the project; and Tracy and I had a blast exploring these ideas with them! Categories: Articles and Presentations, fence lizards, Fun in the Field, Lab News, Summer 2016 Fieldwork, Uncategorized | Tags: Alabama, fence lizards, fieldwork, Tree, tree selection | Permalink. Check out the first chapter of Dustin’s thesis on the “Trans-generational but not early life exposure to stressors influences offspring morphology and survival”, recently published in Oecologia! Environmental changes, such as the introduction of non-native species, can impose novel selective pressures. This can result in changes in fitness-relevant traits within an individual’s lifetime or across multiple generations. We investigated the effects of early life versus trans-generational exposure to a predatory invasive insect stressor, the red imported fire ant (Solenopsis invicta), on the morphology and survival of the eastern fence lizard (Sceloporus undulatus). We captured gravid lizards from high-stress populations with long histories of invasion by fire ants and from uninvaded sites. Resulting hatchlings were exposed weekly to one of the three treatments until they reached maturity (42 weeks): (1) sub-lethal attack by fire ants; (2) topical application of the stress-relevant hormone, corticosterone (CORT), to mimic the stress of fire ant attack; or (3) control handling. Exposure to post-natal early life stress (fire ants or CORT) did not interact with a population’s evolutionary history of stress to affect morphology or survival and early life stress did not affect these fitness-relevant traits. However, morphology and survival were associated with the lizards’ evolutionary history of exposure to fire ants. Offspring of lizards from fire ant invaded sites had longer and faster growing hind-limbs, gained body length and lost condition more slowly in the first 16 weeks, and had lower in-lab survival to 42 weeks, compared to lizards from uninvaded sites. These results suggest that a population’s history of stress/invasion caused by fire ants during ca. 38 generations may be more important in driving survival-relevant traits than are the early life experiences of an organism. You can read more about Dustin’s research here and here! Categories: Articles and Presentations, fence lizards, Lab News, Uncategorized | Tags: Dustin Owen, fence lizards, Research | Permalink. Last time I talked about looking at how maternal stress effects egg nutrients and we have found that maternal stress increases yolk protein and decreases yolk lipid concentrations! With that out of the way, today I am going to talk about the next project I am working on which involves brains. We know that maternal stress can have many effects on animals, such as changing their hormone concentrations and behavior, however less is known about how maternal stress influences hormone receptors in the brain, so I wanted to explore this. First you have to preserve the brain and then slice it thin so you can eventually look at the cells. The white circles are brain slices, important to not let them dry out! You also want to make some sort of barrier around the slices so fluid stays on the slides as they incubate in the different fluids. I used a barrier pen, but you can also use clear nail polish! Next, through a series of washes and solutions, you want to punch holes in the cell membranes so your antibodies can get in and bind with the receptors. Because some of the solutions have to incubate for a long time, its best to have them in an enclosed container with a wet paper town so the fluids don’t evaporate. After the solutions are on, you want to let them incubate on a gently rotating surface so the solution moves and the antibodies can bind to the appropriate receptors. You can use different antibodies to bind to different receptors, so we used ones that bind to stress hormone receptors. Sometimes they incubate at room temperature…. …and sometimes they incubate in a refrigerated room. After you get the different antibodies attached to the receptors, you need to add something to differentiate those cells. For that we use a diaminobenzidine , or DAB for short, solution. However, you have to be really careful with this, as not only is DAB a hazardous material as a solid, to get it to dissolve into a fluid you need to use 10M hydrochloric acid, which has a pH of somewhere around -1.0 (measuring pH gets very weird when you get strong acids and are below 0)! Not only hazardous, but will also melt through organic things! However, if we add this to our brain tissue without correcting the pH, that would be very bad! So by using a base (NaOH) and moving quickly (don’t want the DAB to come out of solution) we can correct the pH using a pH meter. pH meter along with solutions and protocol. Once we bring the pH back to around neutral, we can add it to our brain slices so the dab will cause a color change in the cells with receptors for stress hormones. The thicker slices (50um) have more receptors so they are darker then the 15um slices. Finally, after removing all fluids and sealing the slides with a cover slip, we can look at the slices to see what cells have receptors! The darker cells have stress hormone receptors compared to the tissue at the top. The question I want to address with this technique is if maternal stress effects the amount of stress hormone receptors in the brains, so stay tuned! Categories: fence lizards, Lab News, Maternal Stress project, Summer 2017 fieldwork, Uncategorized | Tags: brains, fence lizards, hormones, lab work, laboratory, neurobiology | Permalink. While most of my work has been on measuring hormones and metabolites from blood, or recording behaviors, I decided to try my hand at something new. I wanted to see if I could measure the contents of a lizard egg! As eggs can vary widely in the volume of water they contain, the first thing I had to do was dry the egg. Because I wanted to measure proteins and lipids, I wasn’t able to heat the egg up though, so instead I used a freeze-dryer. Once dried, I carefully removed the shell (because shells are reaaaaally hard to grind) and then homogenized the yolk sample. Once the yolk was ground up, I needed a way to extract the proteins and lipids from the yolk. To do so, I weighed out a specific amount of the egg, added some dangerous chemicals, and then filtered that solution through an incredibly tiny filter. The size of the holes in a coffee filter are 20 microns, while the size of a bacteria is 0.6 microns. This filter had holes that were 0.2 microns! After filtering the solution, I could then try to measure the amount of proteins and lipids. To do so, I added a tiny drop of the solution to a piece of quick dry paper. Once the paper completely dried, I was able to shine a light through it and get an absorbance value. Stay tuned for the results of what I found! Categories: fence lizards, Lab News, Research in PA, Uncategorized | Permalink. Conference time for the Langkilde lab! The Langkilde lab has recently returned from its annual pilgrimage to the SICB (Society for Integrative and Comparative Biology) meeting, which this year was held in beautiful New Orleans! All our lab members presented talks, and had a great time networking, catching up on top research, and telling people about our own. Below are some of our thoughts on the meeting, summaries of what we presented – and some tips for conference-goers from all fields! “I talked about a paper I’ve been working on from our field season in Alabama last summer. Animals encounter environmental stressors daily; how does frequent, low-level stress influence survival and reproductive success? We show that, in Eastern fence lizards, a daily dose of low-concentration stress hormone led to increased adult mortality, and decreased hatching success of her eggs. This was the first conference I’ve been to where animal behaviour hasn’t been the primary focus – this reflects my broadening interests – I’m really excited by integrative research, so this meeting was a great way to see what other people are doing in more mechanistic fields (physiology, genetics, etc). It gave me lots of ideas for taking my own work forward! “I talked about the effect of temperature on the mode of locomotion a snake uses. As a reptiles body temperature changes, so does its ability to perform specific tasks (digest a meal, sprint away from a predator, etc). I was interested in how body temperature affected a snake’s ability to move, or slither, across its landscape. I found that body temperature does affects how well they move, but also affects how they move. As a snake warms up, it changes its mode of locomotion, uses different muscles, and performs differently. One could compare this to a horse trotting at lower body temperatures and galloping at warmer body temperatures. Obviously these are two different types of performances, and the question we raised with my talk is “Can we compare different performances across a single thermal performance curve?” We argue that it depends on the question being asked. Are you interested in the muscles, or the mechanisms behind the performance and how temperature affects those mechanisms? Or, are you interested in the ecological ramifications of slithering across the landscape (i.e., escape a predator)? Comparing different modes of locomotion along the same thermal performance curve may be flawed if your question is more the former, but may be justified if your question is more the later. What I enjoyed most about SICB was talking with fellow colleagues and introducing myself to many new people. SICB is a huge conference, but with a little effort, you can easily cross paths with someone conducting research you are interested in, someone whose research you’ve admired, someone you’ve only talked with on social media, and now you can see that person face-to-face, introduce yourself, and make a new connection. And who knows, you may even grab a beer with a few of them. “I presented on the impact of a stress treatment on maternal behavior and offspring physiology and morphology. The thing I enjoyed the most was getting to meet not only senior researchers but also new researchers and hearing both of their perspectives. “We already know fire ants are an invasive predator to many organisms, including fence lizards. What I want to focus on is the interaction of Fence Lizards and Fire ants, but as a prey source. This is the first step in my research, by using this study system, to understand how native species adapt to invasive species. The academic side of me really enjoyed meeting other scientist and just chitchatting in informal ways. The 24 year old side of me loved the location of SICB, considering it was in New Orleans! “The water chemistry of vernal pools are often impacted by the environment. Changes in the pH and UVB impact the larval amphibians that live there. But how? Stay tuned for an upcoming publication! I LOVED meeting new people. I especially enjoyed meeting people who are working outside of my field of study. Their perspectives on my work are often very different than those within my field and I learn a lot from them. “Going to SICB for the first time was fantastic, and New Orleans is a peculiar, very musical city, which I appreciated a lot. Being exposed to research from large variety of fields in biology certainly allowed me to appreciate other research areas better, so I definitely recommend attending talks that are out of your comfort zone. You never know what new ideas you might come up with! “I presented info on validating the phytohemagglutinin (PHA) skin test in the green anole as a test of cell-mediated immune function. I also discussed how there are different types of PHA, and how the immune response to PHA differed in the anoles between two of these types (PHA-P and PHA-L). I most enjoyed going to talks, and meeting with researchers whose work I’ve been interested in. Also, the food was great. Many of you would have played with Mexican Jumping Beans as a child. Ever wondered why it is that they jump? I presented some undergraduate-led research revealing what motivates this fascinating behavior. Categories: Articles and Presentations, Lab News, Uncategorized | Tags: conference | Permalink. Now that our field seasons are (mostly) over, the members of the Langkilde lab have been busy processing the blood samples we collected over the summer. As I wrote last time, most of us are looking in some way at the impacts of environmental stressors on an animal’s behaviour, and the characteristics of the offspring they produce. In order to test these questions, we need to be able to quantifiably measure the stress levels of the animals we study. To do this, we took blood samples from our study species in the field to measure levels of “stress hormones” (glucocorticoids, factors produced by the adrenal glands in response to stress). These hormones circulate in the blood, and correlate with the baseline stress levels of an individual – the more glucocorticoids we find in the blood, the more stressed an animal is. We determine the concentration of glucocorticoids in our blood samples by first centrifuging the sample to separate red blood cells from the plasma (the clear fluid in the eppendorf tube below), and then running the sample through an enzyme immunoassay. I’ve had a lot of fun learning these techniques this Fall, processing my lizard samples, and helping Chris process some of his rattlesnake samples! I’m looking forward to reporting back on the exciting results these data contribute to over the next few months. Preparing samples with Chris and Danielle! Categories: Lab News, Summer 2016 Fieldwork, Uncategorized | Permalink. There is unrest in the Langkilde Lab. Several members have declared their intention to graduate and leave the Penn State University. This graduatist movement, under the leadership of the mysterious Doctor Thawley, will make it difficult for the limited number of graduate students left to maintain scientific rigor and order in the fence lizard universe. Principal Investigator Tracy, the Head of the Biology Department, returns to the field to orchestrate the critical succession of power and saurian expertise in the upcoming research season…. The past few weeks have been eventful ones in the Langkilde Lab. Gail and I were both repping the lab at the inaugural Graduate Student Awards Luncheon. I received the Intercollege Graduate Student Outreach Achievement Award, an award close to my heart, for bringing research to the community and “commitment to advancing the welfare of the public through scholarly pursuits.” Gail received her highly prestigious Penn State Alumni Association Dissertation Award which included a very spiffy and heavy Distinguished Doctoral Scholar Medal. Previous lab members have received both of these awards, and we hope that our new lab members will continue this tradition of excellence and outreach! 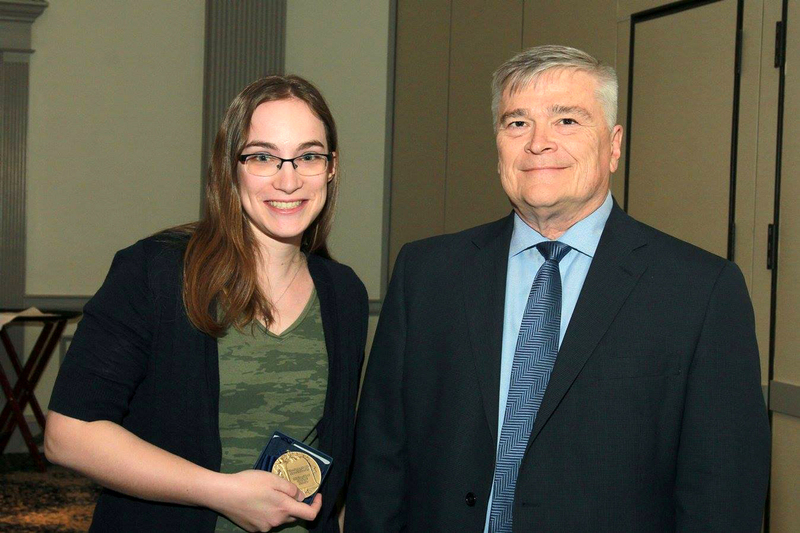 Gail receiving her totally legit medallion from Penn State President, Dr. Eric Barron. Gail and I also both graduated this past Sunday. 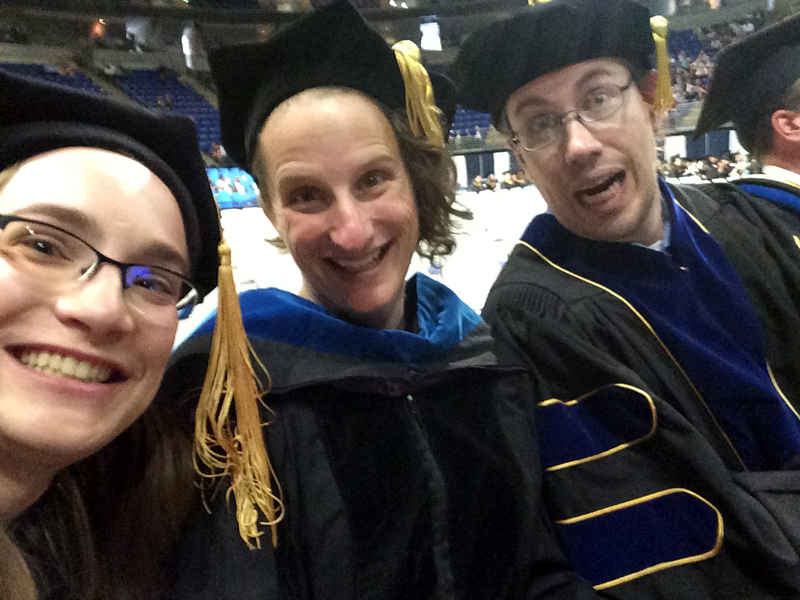 It was a great chance to hang out in the last row of the huge auditorium and crack jokes with Tracy, observe the diverse footwear of graduating graduate students, and attempt to determine the school with the most awesome PhD robes. We were totally serious throughout the entire two hour ceremony. Unlike some other awards ceremonies (*cough* Awards Luncheon *cough*), we were allowed to sit and walk together which was great. None of us tripped while negotiating the steep, narrow stairs to the stage, and I even managed to shake the President’s hand with something approaching poise. I was the only graduate wearing formal Birkenstocks at the ceremony. 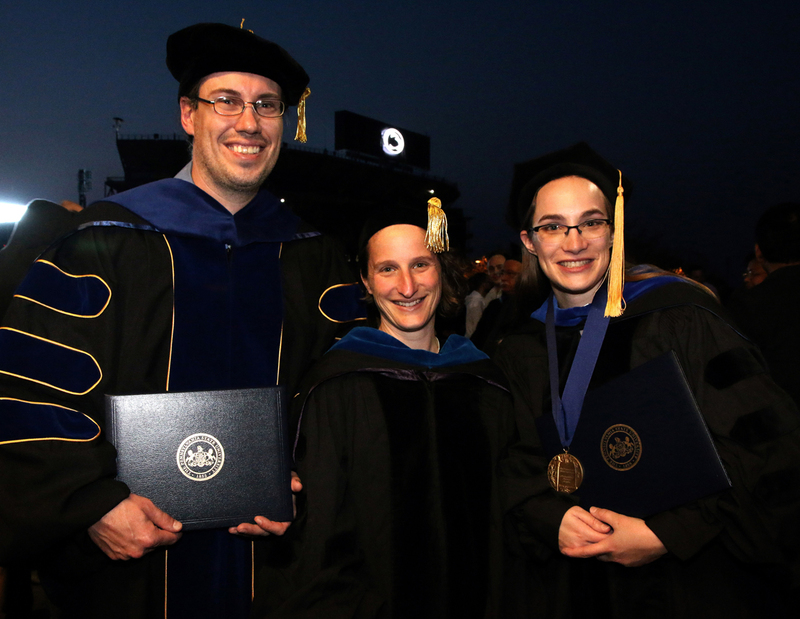 Afterwards, we gathered outside with our families and friends for a few pics to document our snazzy regalia and the fact that an institute of higher learning actually saw fit to give us advanced degrees. 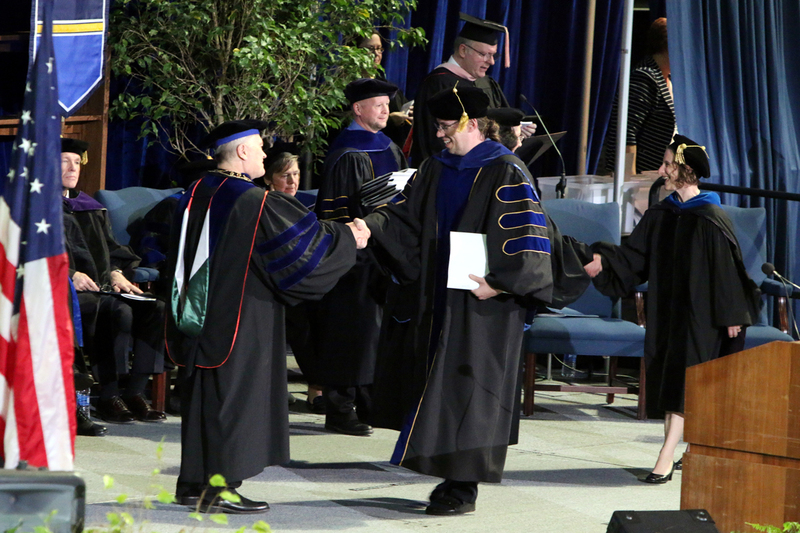 Lab Undergraduate Extraordinaire, Mark Herr, graduated as well (though we have no photographic evidence of this). Mark has worked in the lab for four years and published several papers. 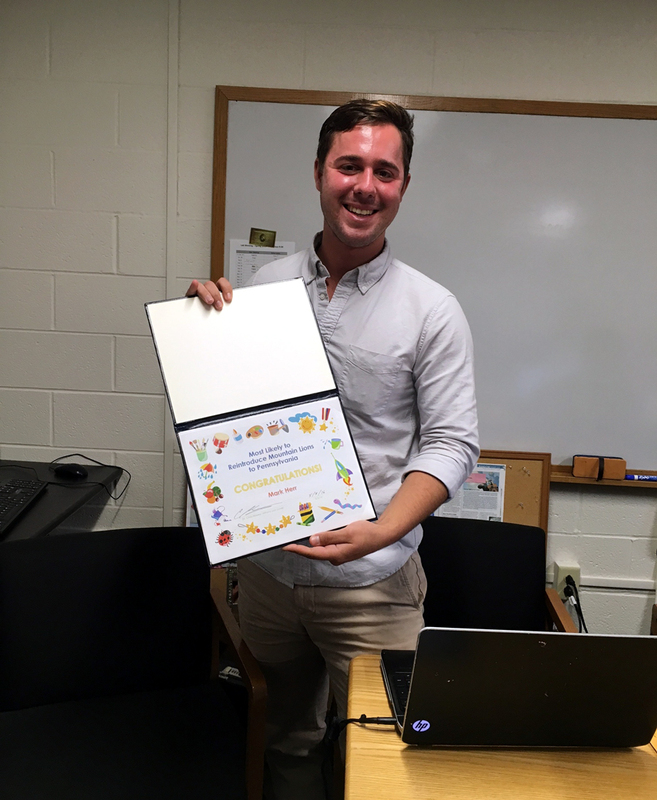 In recognition of his work, Mark received several lab commendations, including a certificate of excellence for Use of the Word “Devastating” on a Daily Basis and the Award for Forcing the Creation of a Special SSAR Award for Undergraduates. Mark Herr is recognized for his efforts to reintroduce large mammalian predators to control overpopulation. In spite of these losses, a new hope has arisen in the next generation of lab graduate students and post-doctoral scholars. Tracy is leading the bulk of the lab force, including post-doc Kirsty and graduate students Cam, Dustin, David, and Michaleia, to Solon Dixon, where an old ally, Nicole Freidenfelds, will help them discover clues as to how maternal stress hormones influence behavior, stress physiology, and metabolism. Gail has volunteered for one final mission in the field: training a team of lizard neophytes including Braulio and Caty to capture fence lizards, especially gravid females, at sites in Arkansas and Tennessee that remain uninvaded by fire ants. This team will return to the lab and allow these female lizards to lay their eggs. They hope to determine if ladies bearing typically male characteristics, in this case blue throat badges (“beards”), also have bearded offspring. Stay tuned this summer for more exciting developments in the fence lizard universe! Categories: Lab News, Summer 2016 Fieldwork | Tags: award, graduation, Research | Permalink.